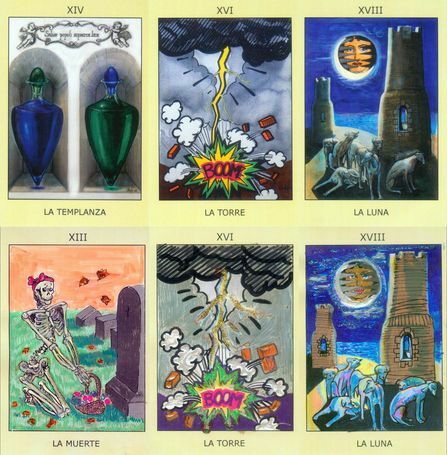 Despite his age this tarot has many modern elements and also one of the first to attribute different people to each of the minor arcana's for example the cups are represented by mermaids and the swords by dwarfs. Thierens who was a Dutch officer in the Royal Marines, an astrologer (he is seen as the founder of the modern astrology in the Netherlands) and esoteric author redesigned the associations of the cards in a way different to Waite (of whom he seems to have picked up some info) and of the Order of the Golden Dawn, yet some of his influences are said to been the Theosophical movement. One example of the changes he made in the majors is that he assigned the zodiac signs to the first twelve and planets to the remaining ten. Yet another part of the lot I bought. For those following my blog, it will be clear I love the Tarot de Marseilles-familly, so obviously I had hat to get those out of the lot availlable. This elegantly drawn black and white rendition of the TdM was created and published the artisanal way on thick uncoated papers and in limited editions in the 80ies by the then prolific Gilles & Anne Hipeau who created 4 different decks (as far as I know) - all based upon historic French decks. 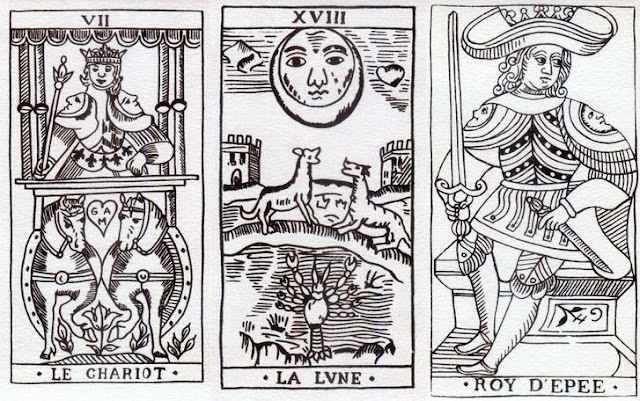 This one is based upon the Conver and the Fautrier decks available in the collection of the Bibliotheque Nationale de Paris, and was intended to be coloured by the owner . This is another rare deck I got out of the collection i mentioned last time, the Gli Arcani di Elisabetta is the third tarot by Elisabetta Cassari and is limited to 99 decks only but halfway through the artist stopped coloring them which is very understandable hand-painting 99 x 22 cards is a huge task for any person - and knowing the low price these where going (only € 130 according to the information I got, at that same time the black and white version was sold at € 50) not that rewarding. This deck and all deck by miss Cassari dare to depict the human condition is all it's painful and negative sides possible - no compromise no bright side to be found here. Man is worst danger possible to his fellow man, the powerful use that power to grind and torture those under them down into total submission at their only whim. These are truly the dark ages depicted here, but done in such a stile one can only admire the artists craftsmanship. This whole set stands out as a special luxury product, the sturdy nice sized cards are housed in a cardboard box this is in his turn placed in a cork made box with vinyl top and printed on with gold the frontispiece. I was recently lucky enough to be able to buy some decks from a collection being sold off, so my collection got enriched with some new and interesting treasures. This deck was commissioned by Lancôme (a luxury beauty brand owned by L’Oreal since 1964) to promote its perfume “Magie Noire”. 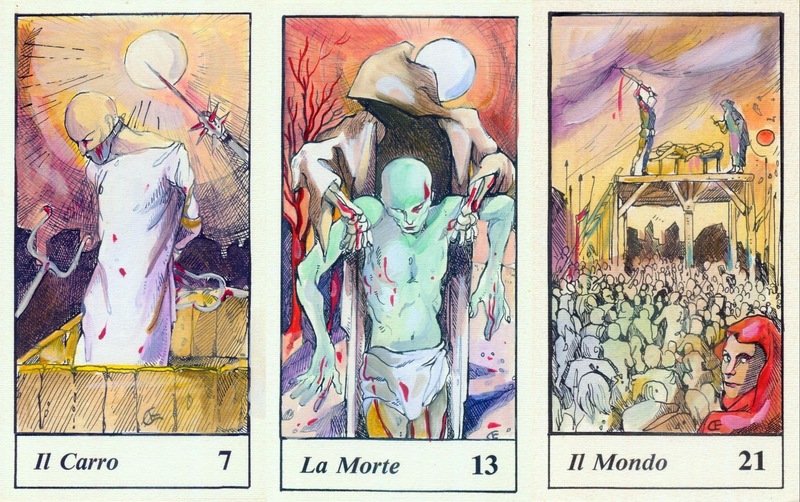 The cards were presented and described in the May 1979 issue of the Italian magazine Annabella. But knowing this is a promotional item, it’s normal, yet not obvious to find always, to see it appear in other languages as here in Dutch. 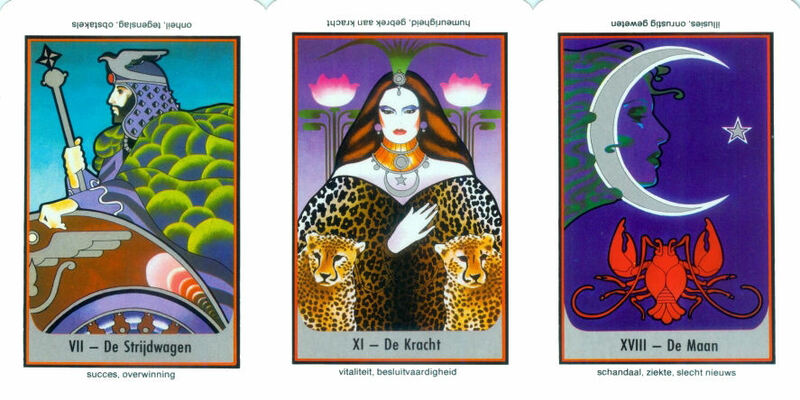 The artist who created this deck Giancarlo Carloni did a wonderful job combining the archetypes of the tarot with the world of refinement and luxury as represented by Lancôme these cards breathe that atmosphere that would be fitting to any grand mansion or 5 star hotels from the seventies. For those into tarot tarot comes through other areas of their lives. A prime example is the creator of this deck, reader and all-round tarot lover Marcia McCord created this deck out of her passion for antique picture postcards and dedicated to her mother who ran an antique shop and died in 1983, the last conversations miss McCord had with her mother was about antique picture postcards. From the LWB we learn that picture postcards were approved by the US Post Office Department in 1898. Same day delivery allowed friends to keep up with the evenings entertainment, as well as personal news. The images used in this deck come from the period 1900 to 1909 to for an eclectic mix ranging from the sweet to the comical and all possible variations, with depictions of persons of all walks of lives and origins to the personal taste of the creator and each time to make a great fit between the image and the meaning of each card. Miss Alma Ajo produced a nice little treasure here, well actually 2 as she sells them in two versions "as they came from the printer" and one version where she hand colored with added glitter and heightened color version (this hand made precede makes each deck of this version slightly different and individual). I of course got this deck in both versions and am very happy i did - not only are these very limited, of both versions there are only 20 decks, but the differences and feels between both make it well worth getting them. The style could be described as surreal with a sense of humor and a vibrant sense of life shining through, at only 3,2 x 4,8 inches they are 22 little tarot portraits.